We all strive for happiness. According to Aristotle it is the ONLY thing we want for it’s own sake. Everything else we do is in order to be happy - in one way or another. But happiness is not a simple concept. Aristotle distinguished between four different levels of happiness. 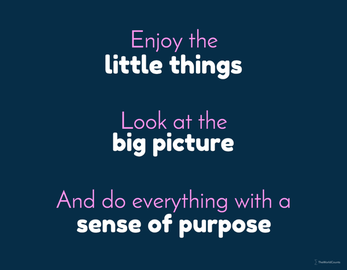 Happiness at the first level is simply about sensual gratification based on things / something external. This kind of happiness can be intense but is short-lived. People focusing exclusively on level 1 risk to hit a crisis where life seems shallow and without meaning. In other words there is a limit to the pleasure you get from a new car, a holiday, a nice meal etc. if this is the ONLY source of happiness. As long as you don’t forget the other levels there is absolutely nothing wrong with enjoying the pleasures of level 1 that life can provide! Happiness level 2: Felix. Ego gratification. Happiness from comparison: being better, more admired than others etc. You feel this type of happiness when you for example win in sports or get a promotion. Everyone likes admiration and winning to some extent but people varies a lot regarding how strong their competitive nature is. For some it’s everything, for others it’s just a very minor and very short lived pleasure. Happiness from continuous comparison with other people is unstable because no one (or very few people) can win in all domains of life all the time. In case of failure, focusing too much on this level can lead to frustrations and a sense of worthlessness. Excessive focus on comparison and self-promotion also risk to alienate the people around you and can lead to self-absorption, jealousy, cynicism, and the oppression of others. Happiness level 3: Beatitudo. The happiness from doing good for others and making the world a better place. As this level we move away from ourselves to focus on the well-being of others. In essence our own happiness depends also on the happiness of others. 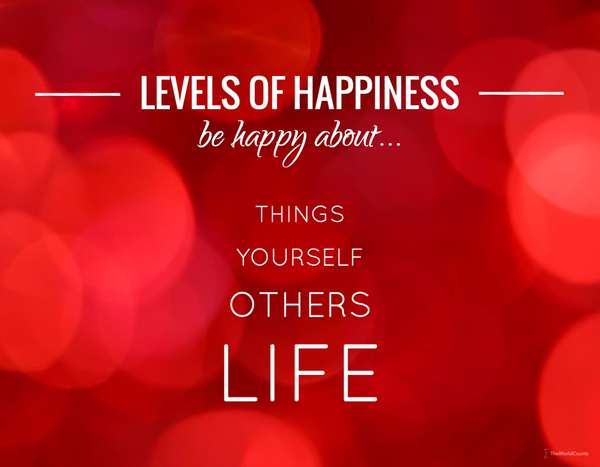 Level 3 happiness is more lasting and, for most people, provides a deeper feeling of meaning than level 1 and 2. The limits of level 3 happiness can be said to be human imperfections. Nobody is perfect and human relationships involve disappointment, jealousy, and the risk to be hurt. That’s part of life. Level 4 happiness is the most difficult to describe. It involves a search for fullness and perfection. It has to do with finding the right balance between the other levels... and then some. Psychologists have labelled this desire for ultimate happiness a call for connection to the larger universe or a sort of transcendence. Some fulfill this desire through spirituality or religion, others through philosophy, art, or scientific endeavours to find answers to some of the big questions of life, human existence and the universe. There’s no definitive or universal answer. You have to find your own calling! In his book “Happiness: The Science Behind your Smile” Daniel Nettle describes three levels of happiness. 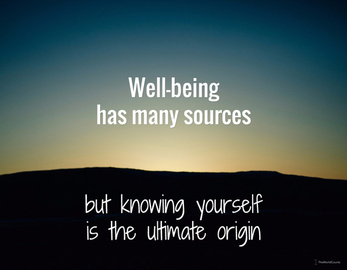 In his book “Flourish” Martin Seligman single out five elements of "well-being". Five different dimensions of the concept of “well-being” can be identified. The World Counts helps you discover tools that can improve your life, as well as the planet's.